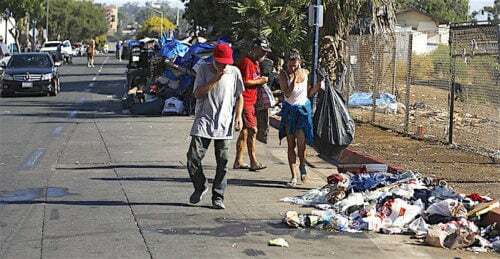 In California, a Hepatitis A outbreak of nearly epidemic proportions is infecting and threatening to infect huge numbers of homeless people living in makeshift tent cities located from San Diego, all the way north to Sacramento. The contagious disease, characterized by jaundice and flu-like symptoms, can lead to death in some cases. 17 have died and 569 people have been infected in the 11 months since the outbreak began in San Diego last November. Major cities up and down the state have been affected. 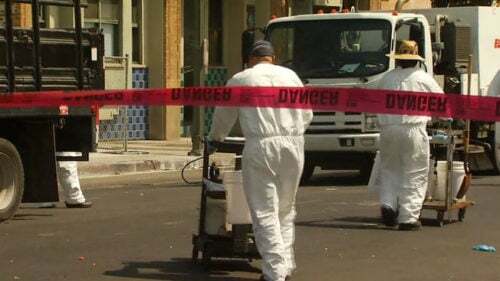 Cities all over the state are scrambling to contain the outbreak by disinfecting streets and trying to get homeless populations to be vaccinated. But many homeless are trying not to be found, due to trouble with the law or other reasons and resist getting the shots. The problem is particularly complex. The last numbers available on Hepatitis A, from the CDC, are from 2015. That year, nationwide, 1,390 people were reported infected. In that year, California had 179 cases, as opposed to the high totals for this current outbreak. California has over an estimated 115,000 homeless people. And laws have been passed in multiple locales that prohibit law enforcement from enforcing housing ordinances, allowing the tent cities to grow uninhibited. 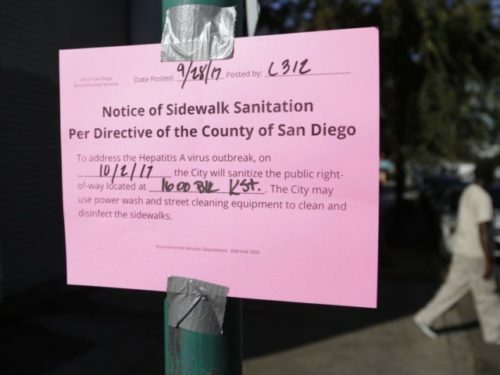 Although no one knows the exact reason for the outbreak, it is thought that it may have started when San Diego made an effort to clean up the area around Petco Park for the MLB All-Star Game. The city caused the homeless, the prostitution trade and the drug dealers to move to areas away from the downtown tourist venues. In an effort to bring that about, the city locked public restrooms. Additionally, San Diego banned the use of plastic bags, which have long been used by the homeless to dispose of human waste when there are no public bathrooms. It is thought that this set of circumstances has contributed heavily to the Hepatitis A outbreak. The Left, as personified by California politics, is always lecturing the rest of the nation on how heartless they are, how they need to help people, especially the homeless. And it is Californians who have made it more difficult for the homeless in their state. The Leftists in California’s cities have made rules that make life harder and more medically unsafe for those who are living in the streets. The Left is always trying to claim the moral high ground. But the policies of the Left don’t work. And now the citizens of California are paying the price. Californians, this is your tax dollars at work.